Here you will find important background information on the EPMM Strategies along with the most up-to-date information about the efforts underway to develop a comprehensive monitoring framework for ending preventable maternal mortality, all of which will be helpful as you prepare for the meeting. In February 2015, the World Health Organization (WHO) released “Strategies toward ending preventable maternal mortality (EPMM)” (EPMM Strategies), a direction-setting report outlining global targets and strategies for reducing maternal mortality in the Sustainable Development Goal (SDG) period. The result of extensive consultations with stakeholders around the globe, the targets and strategies are grounded in a human rights approach to maternal and newborn health and focus on eliminating significant inequities that lead to disparities in access, quality, and outcomes of care within and between countries. The comprehensive strategic framework for maternal health proposed by the EPMM Strategies report applies across the reproductive, maternal, newborn, child and adolescent health (RMNCAH) continuum of care. It also includes attention to the social, political, economic and health system determinants that contribute to maternal health and survival. Finally, the framework is intentionally non-prescriptive and offers broad strategic objectives rather than a list of clinical interventions. 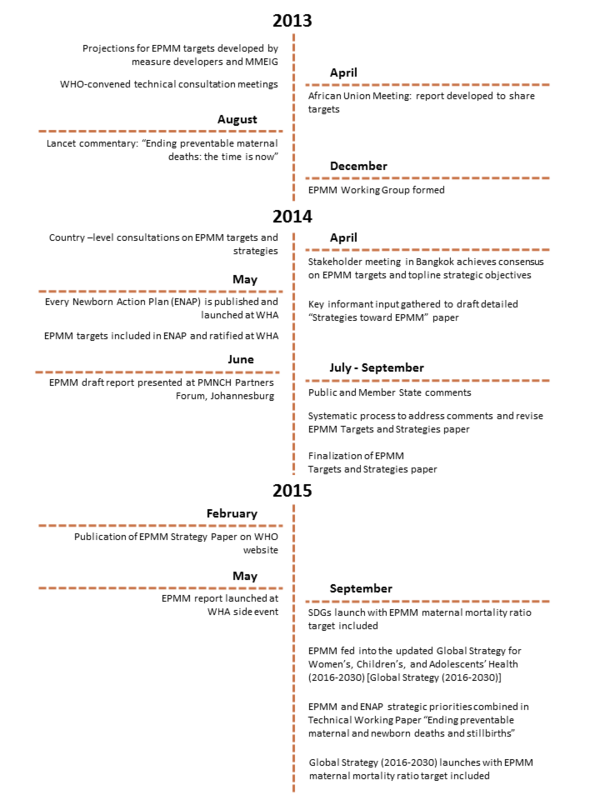 The development of the EPMM targets and strategies was a collaborative effort. The timeline below details the events that led up to the launch of the report, and show its contributions to the global goals set forth in the SDGs and the Global Strategy for Women’s, Children’s and Adolescents’ Health (2016-2030) (Global Strategy). Average global maternal mortality ratio (MMR) of less than 70 maternal deaths per 100,000 live births by 2030. By 2030, no country should have an MMR greater than 140 per 100,000 live births, a number twice the global target. — Empower women, girls, communities. — Integrate maternal and newborn care, protect and support the mother-baby relationship. — Ensure country ownership, leadership and support legal, regulatory and financial frameworks. — Apply a human rights framework to ensure that high-quality reproductive, maternal and newborn health care is available, accessible and acceptable to all who need it. — Improve metrics, measurement systems and data quality to ensure that all maternal and newborn deaths are counted. — Allocate adequate resources and effective health care financing. 1. Address inequities in access to and quality of sexual, reproductive, maternal and newborn health care. 2. Ensure universal health coverage for comprehensive sexual, reproductive, maternal and newborn health care. 3. Address all causes of maternal mortality, reproductive and maternal morbidities, and related disabilities. 4. Strengthen health systems to respond to the needs and priorities of women and girls. 5. Ensure accountability to improve quality of care and equity. The EPMM Strategies report fits into the context of a larger effort by the global health community to ensure that maternal health remains a priority in the next development agenda for all countries. The EPMM global maternal mortality ratio (MMR) target was adopted by both the SDGs and the Global Strategy. 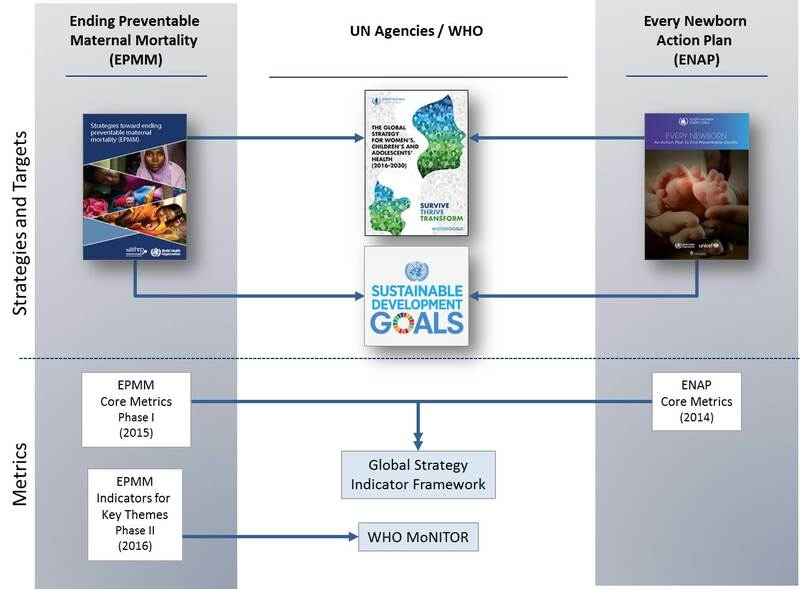 The guiding principles and strategic objectives from EPMM were harmonized with those outlined in the Every Newborn Action Plan (ENAP) and together they informed the Technical Working Paper on ending preventable maternal and newborn deaths and stillbirths that fed into the updated Global Strategy. Following the launch of the EPMM Strategies report in February 2015, efforts began to develop a comprehensive EPMM monitoring framework to track progress. The EPMM Working Group held a planning meeting on 1 May 2015 to agree on the broad goals for this work, to be undertaken in two phases. In October 2015, Phase I of EPMM indicator development was completed, identifying a core set of coverage and impact metrics closely linked to direct causes of death for global monitoring and reporting by all countries. The set of EPMM core metrics from Phase I fed into the development of the Global Strategy Indicator Framework that took place in February 2016. During Phase II, the focus is on building consensus on a set of supplemental “means of implementation” indicators for the 11 key themes identified in the EPMM Strategies report. These themes highlight the broad social, political, and economic determinants of maternal health and survival. The indicators developed in Phase II will be passed on to the WHO’s recently-formed Mother Newborn Information for Tracking Outcomes and Results (MoNITOR) expert advisory group. The diagram below shows the relationships between EPMM, ENAP, the Global Strategy and the SDGs. 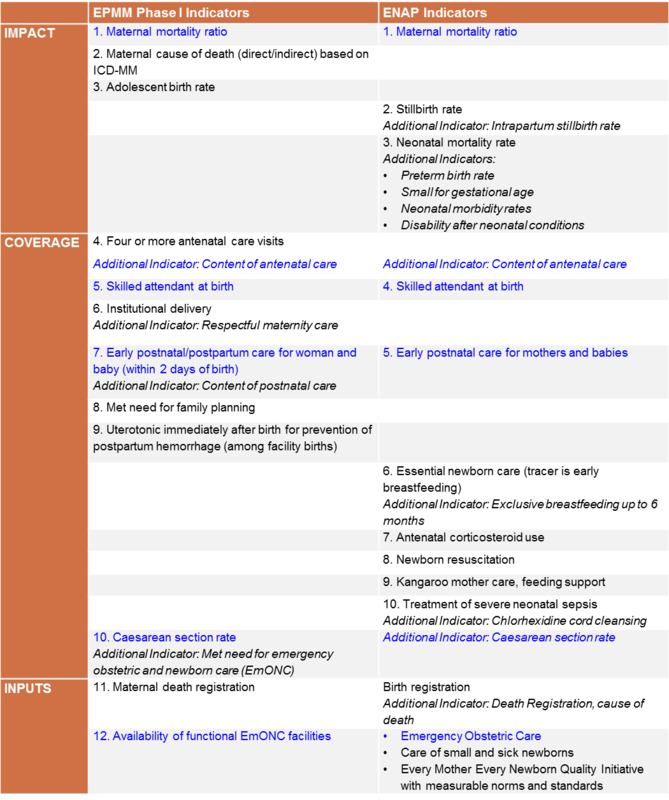 The core set of Phase I EPMM indicators (for proximal determinants of maternal survival) is shown in the table below alongside the ENAP indicators. Indicators in blue show where the two sets overlap. The EPMM Phase II indicators reflect and are well-aligned with the social, political and economic priorities highlighted in both the SDGs and the Global Strategy, including equity, poverty reduction, gender equality and a human rights approach to health. Through this iterative consultation process stakeholders will offer their consensus on a balanced set of indicators that are relevant, important, useful, scientifically sound, and feasible for monitoring the critical distal determinants of maternal health and survival. It is hoped that a set of indicators which provide a means of implementation for these core principles in the specific context of maternal and newborn health and survival, as well as recommendations for further development of indicators that are important but need refinement before they can be reliably measured and tracked, will be substantive contributions to a comprehensive monitoring framework for the new development agenda. The key outcomes from Phase II will be shared with the WHO’s recently-formed MoNITOR expert advisory group. Together, the EPMM indicators from Phase I & II will round out a comprehensive monitoring framework for ending preventable maternal mortality. The ultimate goal of this effort is to support the Indicator Framework for the Global Strategy – particularly in its Thrive and Transform agenda – and the SDGs, and to complement other global monitoring efforts.